The same 2.5 centimetre barnacle was used by both French and Australian examiners — but different techniques applied. “For my analysis, I used a laser to create little holes of 20 microns, over the length of the barnacles. In all we did 1500 analyses,” said Professor De Deckker. The start of the growth was around 24 degrees (Celsius) and then for quite some time, it ranged between 20 and 18 degrees (Celsius). And then it went up again to around 25 degrees. This is surprising. The graphic above shows the water temperature in July 2005, which I take to be a rough proxy for the water temperature in March 2014. (I would be extremely grateful if someone could extract granular sea-surface temperature maps for March 2014 to July 2015 from NASA or NOAA databases available online.) 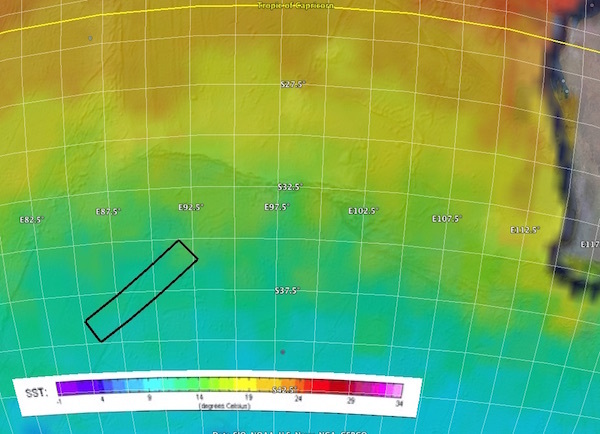 It shows that the waters in the seabed search area are about 12-14 degrees Celsius. To find 24 degree water would mean trekking 1000 miles north, above the Tropic of Capricorn. It has long been known that Lepas anatifera do not grow in waters below about 18 degrees Celsius, and that in order to begin colonizing the flaperon (if it began its journey in the search zone) would have had to first drift northwards and wait for warmer months and warmer latitudes. What’s peculiar is that this particular Lepas would have to have waited a good while beyond that, until the flaperon arrived in water six degrees above its minimum. As I’ve written before, Lepas naupali are common in the open sea and in general are eager colonizers of whatever they can glue their heads to. Peculiarity number two is that after this period of initial growth the flaperon then found its way into significantly colder water, where most of its total growth took place. What’s weird is that every drift model I’ve ever seen shows currents going through warm water before arriving at Réunion. Where the heck could it have gone to find 18-20 degree water? And how did it then get back to the 25 degree waters of Réunion Island, where it finished its growth? I’m frankly baffled, and am appealing to readers to ponder historical surface temperature data and drift models to help figure out what kind of journey this plucky Lepas might have found itself on. You’ve got any new insights on the barnacle-problem allready? The topic seems almost forgotten.. but still it’s interesting to me. They are also picking up the divorce question again, after it was denied by the family for a while. “Divorce” might not have been the issue (if I recall the brother-in-law’s take on it correctly), but that might not be the important part of it, since it is reasonable to believe that it depends on how it is conceived by, in this case, the husband. Vielleicht war das Ziel auch Exmouth/Learmonth. Da gibt es Presse, aber keine permanente Besatzung. All I see is relatively typical middle-age behaviour, but no smoking gun yet. Rumours of marriage issues probably exaggerated by the yellow press, and unheard of as a reason for suicide/murder of innocent people. The political angle not really pointing to suicide. I think these really are two separate issues. On one hand, the satellite data (and debris) indicate straight-line flight and uncontrolled descent, so this is were you want to look for the plane. Inmarsat only advised to discard the final (but not penultimate) BFO and according to the ATSB there have since been further test and trials. The error could have been interpretation of the 18:40 phone call BFO, irrespective of scenario. The other question is how to explain that and whether or not there are alternatives to suicide (and deliberate depressurisation is just as much conjecture). Perhaps the new Madagascar debris and possibility of an in-flight fire can shed some new light on that. It must be in Australia for a week now and has not so far been ruled out as possible evidence. I doubt MH370 was like 99.999% of all flights. Back to the discussion.. I think we should be carefull not to slip too deep into private matters which no one can judge on anyway only reading ‘news-articles’. 1) “There is a rebel in each and every once of us. LET IT OUT! Don’t waste your life on mundane life style. 2) “So it’s time they try and dismantle us. We are not going to be quiet. 3) “Non vi si pens quanto sangue costa” translated = “There they don’t think about how much blood it costs”. The last quote comes from canto XXIX of Dante’s Inferno. The context here is Beatrice deploring the lack of appreciation for the martyr’s sacrifices. Captain Shah first highlights this quote in an article from a friend…then uses it himself in reference to PKR members and others he believes to be targeted by the govt. The above quotes were first brought to my attention more than a year ago by Spencer on this very blog. Shah and Pardi had a shared political interest, and were both active in the opposition party. Your Hillary Clinton example is not very appropriate. The term “opposition” party is not often used to describe the relationship between the republic and democratic parties in this country. Opposition is a strong word implying much more than simply a divergence of views. In my entire life I have never known a man to visit a woman because he liked to play with her children. I think just about anyone would consider that pretty weird for a married man with children of his own. From the FB quotes above it is easy to draw the conclusion that Shah had something on mind, and that sooner or later he might act out his fantasies. Proof? No. Good reason to be highly suspicious? Yes. Taken in aggregate the number of things pointing to Shah is simply overwhelming. Particularly in the absence of any credible alternate theories. Part of what I am reacting to is a US TV documentary on YouTube which says the co-pilot was (paraphrasing) squeaky clean with respect to the possible suicide motive, and then the documentary basically says the pilot Z was equally clean. That is the only comment in the whole documentary that I could not agree with. I am just sensitive to areas where I think the press tries to portray the event as a mystery by selective choice of emphasis. I am looking for a table of GDAS weather data (wind and temperature) at 1800Z on March 7, 2014 for the SIO at 250 hPa pressure altitude. I have the 2100Z and 0000Z data, but can’t locate the 1800Z data. If someone has the data I would appreciate your sharing it. Thanks in advance. @Ge Rijn, @Nederland, @Johan, Beachten Sie bitte dass jemand nicht die Deutschsprache verstehen. @Ge Rijn, Yes, I agree the barnacle question is very interesting–I’m pursuing it right now and hopefully will have an update soon. Also, regarding the possibility of a “ghost flight” during the last six hours: the absence of wreckage on the seabed means, IMO, that a ghost flight can effectively be ruled out, with possible exception of a scenario in which the plane loitered for a time over the Andaman Sea after 18:40. In this case the plane happened fortuitously to be a descent, or else at just the right place in a circling pattern, to generate the observed BFO. Which seems like a long shot but can’t totally be ruled out, as near as I can tell. @TBill, You list a number of reasons why Zaharie might have been motivated to kill himself: women troubles, money troubles, political dissatisfaction. Yet to my mind these are all dogs that didn’t bark in the night. The Malaysian police have compiled a thousand-page report and found no concrete evidence that he harbored any such feelings. Were they motivated to overlook such evidence? I don’t believe they were, or they would have omitted the “suicide route south” from their internal report. Evidence that might only theoretically exist is very weak evidence indeed. I think in the recent interview Neil Gordon seems to be quite confident that the uncontrolled end of flight scenario is correct but that the aircraft may have descended at 18:40 and in that case could be further northeast but that doesn’t rule out the ghost flight scenario. A point of impact further northeast also seems to be in agreement with drift models. If the current search area can be ruled out, that would shift statistical odds towards an impact around the Broken Ridge area (if the model is correct) imo. In a multi-party parliamentary system with proportionate elections the “opposition” referred to is normally the parties or coalition in minority position in the parliament. As if the Democrats were called the opposition when the Republicans are in office (maybe they are?). Malaysia has a British parliamentary system. In living practise, Malaysia has been governed by a coalition of parties, which is not uncommon since it is hard to achieve both single majority (strong government) and democratic political variety with a high percentage of the population voting. Peculiar for Malaysia (a federation) is that the 13-party(!) coalition has ruled the country since independence in the late 1950s. It is likely due to the state’s federal nature. An opposition outside the political system is “civil unrest”. Considering it’s a slow news day in MH370land I thought we could re-visit this story from 2014. An Air New Zealand 777 captain pissed off that his co-pilot’s random drug test took longer than scheduled and delayed departure, took revenge on his copilot by locking him out of the cockpit. But the copilot was able to unlock the cockpit door very quickly by accessing the EE bay. Similarly, wouldn’t a highjacker have been able to access the cockpit of MH370? Both pilots were stood down – the captain for two weeks and the first officer for a week. Two Air New Zealand pilots were stood down and their cabin crew offered counselling after a frightening mid-air incident on a packed transtasman flight. The drama unfolded on flight NZ176 between Perth and Auckland on May 21, when the first officer was locked out of the cockpit for two minutes. The captain did not respond to requests to open the locked door, alarming crew. The pair had apparently fallen out over a take-off delay. One expert says two minutes is “an eternity” on a flight — and the incident, on a Boeing 777-200 carrying 303 people, has sparked calls for a third crew member to be added to flight decks so no one is ever alone in the cockpit. Air NZ spokeswoman Marie Hosking said the first officer and crew became concerned after the captain did not respond to three requests over two minutes from a cabin crew member to open the cockpit door. The first officer eventually used an alternative method to access the cockpit. For security reasons, the airline would not say how. “Naturally, cabin crew operating the flight were concerned about the inability to contact the captain and became quite anxious,” said the national carrier’s operational integrity and safety manager Errol Burtenshaw. They were offered the support of the company’s employee assistance programme after the flight. Both pilots were stood down — the captain for two weeks and the first officer for a week, and given counselling and additional training. There was “some tension” between the pilots after a 13-minute delay to the flight’s departure after the first officer had to take part in a random drug and alcohol test. Safety and security were paramount and the incident was “unfortunate”, Burtenshaw said. He said the captain did not respond or open the door because he was approaching a navigational waypoint and in his cockpit monitor saw a cabin crew member rather than the first officer ringing. The airline provided a report on the incident to the Civil Aviation Authority. Spokesman Mike Richards said it was satisfied with Air NZ’s actions. The Beijing-bound Boeing 777 and its 239 passengers and crew vanished after the plane left Kuala Lumpur on March 8. A Malaysian investigation last month identified the captain as the chief suspect, if human intervention was to blame. Clark said there was no excuse for the Air NZ captain to not immediately respond to calls, given the MH370 mystery and the fate of other flights, including an Ethiopian Airlines flight hijacked by its asylum-seeking co-pilot this year. “You can push a button and say ‘I’m busy’ … two minutes is an eternity when people reflect on MH370. The transponder can be turned off, the flight co-ordinates changed, the plane depressurised. I give a link to a copy of the file that I use. Way more than you need. You are looking for lines that begin “18 18”. The numbers are decoded straight from the files found at ARL. Swedes will have to stretch a little bit further even to read German. But Hölderlin’s “Der Rhein” is a good challenge. That one was for you. I do agree, it feels a bit cheap to build a case if it turns out the basis is tabloid news. Still, it is (or has been) necessary to discuss him. In that way, also, tabloid speculation can be read with better awareness. And it is interesting to hear Jeff stressing again that the RMP found “nothing”. Have you seen the “internal report”, Jeff? You seem to be citing it. I wonder if the police have had opportunity to look at and evaluate “everything”, in that case suspiscions against Z would really go down, although I can see some pitfalls e.g. for the police interviewing a family doctor in a case like this. But If there is no credible “personal” angle, then there is not enough for a premeditated act. From a “party political” view the lines you cite from Facebook are not necessarily much more than Z trying to incite some political good mood among possible followers. That is one funny thing with party politics: if you say “revolution” but belong to a legit party you don’t mean it literally (which by the way is figuratively in this case). The term opposition party has only been used twice in US Congressional History. I think Zaharie did not understand in a classical sense the notion of martyr as someone who dies in a conflict of faith, holy war, or fight against the evil in the world. His social network activities indicates he was a secular muslim or even atheist. In context, he apparently understands in a secular way “martyr” as an individual who suffers negative consequences other than death (such as being arrested) on account of his political ideals. By contrast, the 9/11 attackers probably held the view that they will be rewarded in afterlife. Zaharie does not appear to be overly religious or have strong views on the post-mortem state of souls. This is very unlikely to have served as an incentive to commit suicide imo. I share your views. I do not think suicide was Z’s plan. … it is highly disappointing that most posters here are taking the ‘default’ position of suspecting the pilot of committing suicide AND mass-murder with not a shred of evidence to support this theory. Everyone, including Zaharie Shah, is entitled to have political opinions and take active part in political activities. If ordinary people don’t take part in politics, politics devolves into something undemocratic. Someone like Shah,a pilot who travels the world and is exposed to foreign media & culture will become acutely aware of the shortcomings of their own political culture, and will be compelled to take action. What possible purpose can it serve to continue to portray ZS as the suspect? Contact Tim Vasquez at Weathergraphics. He has all the data you need – and more ! Well said. Maybe it serves the agenda of some “entity” to have a convenient scapegoat but I suspect it doesn’t suit Malaysia because of insurance issues. Mind you, there is such a shortage of real evidence that many, varied, possibilities still exist IMO and anyway all are entitled to their opinions. Here, where we share ideas, knowledge, thoughts and opinions, we have an individual responsibility to correctly process copious amounts of disseminated information which is obviously easier said than done. Someone here once told me offsite, “he would have a waiting period” before responding to something that annoyed him. Not a bad strategy when posting unverified or unsourced information, which could be validated (or not) with little effort. The most evident abuse of unverified information distribution is the piece written within days, where a “long time friend” of Captain Shah’s, claimed Z had issues and maybe should not have flown. It is almost embarrassing the time I spent trying to find the name of this “long time friend” or any another variation of this story with a different variation. A reporter for the New Zealand Herald originally filed the story from Kaula Lumpur. This 1 “story” was massively repeated with no additions and almost verbatim by the thousands. Providing any links would be ludicrous because there are dozens of them all with the same. By early 2014, he (Zaharie) had begun to withdraw from the political scene, Mr Chong said. Around the same time, Ms Pardi says their friendship cooled, at Captain Zaharie’s instigation, because of a “personal matter”. I will not bore everyone with the timeline of Ibrahim’s long standing charges. It seems odd, even though “early 2014” was post election, if Z was the ardent supporter described, he would have remained very involved. The several weeks leading up to the verdict appeal court date of March 7th, had to be an important time for rallying the the NPR troops of possible party agendas. The “cooling” things with Pardi, (I think you were spot-on with your opinion Dennis) because of a “personal matter”, makes perfect sense to me. Regardless of the multiple wife protocol in Malaysia, I see this as an action of a guy who pulled away from marital problems with a distraction. It may have garnered attention from his wife, which provided emphasis back toward their marriage. It is stated they rode to the airport together that night in their own car (rather than the normal car service pick-up he normally used) and that the last phone call before take-off was also with his wife. There are 2 other major issues that IMO should be continually addressed. (2) The position of Najib’s powerful involvement with both, the now known corrupt 1MBD and (at the time) Malaysian Airlines, of which 1MBD owned almost 70%. I agree with Jeff’s comment, “Evidence that might only theoretically exist is very weak evidence indeed”. But at the same time your statement holds true, because it is taken “in the aggregate” of everything that is known to date. Allow me to pick your brain for moment . Assuming it was a hijacking by unknown perpetrators, what would have been their evaluation beforehand on negotiations being successful? I am inclined to say “not one iota”. Subsequently, is it not likely that these perpetrators would have ordered Z/F to fly into the Malaysian twin towers opposed to flying off into oblivion? I can fully visualize the MG keeping quiet about negotiations taking place for many reasons. Hijackers however would not be so disposed. Your thoughts? Please let me know when you download zip as it takes space. Each file covers the whole world starting from -179.5E, -89.5N, one layer. Data include 360 x 181 points, 23 layers. File name includes parameter name, then yyyy-mm-dd-hh-layer.txt. I have matlab scripts which read all this stuff and interpolate – let me know if you need them. Or you can import directly into Excel. Thank you for responding to my request for weather data. I was able to download sk999’s file, unzip it, and convert it into an Excel worksheet (~900,000 lines!). I will follow up with the other suggestions also to get a complete uniform data set. What I am finding is that the winds varied significantly along the last 3 hours of the flight, so how you average them over the last two legs makes a significant difference in the path when fitting a heading mode. In addition, the changes over 3 hours of time are typically about 5 knots and 10 degrees (also significant). It appears that you need to average a lot of points along a leg and also interpolate between the temporal data sets for the appropriate time at each point along the route. Good comments that Z was an unlikely “martyr” contender. From what we can surmise, he was not an obvious political zealot either. Not sure however if people who work for an MY government entity would have the liberty to openly express different views? Ibrahim’s supporters believe vehemently that he was framed by their own government in order to silence him. The March 7 re-instatement of his conviction would obviously have been construed as “systemic injustice” by the government. There is little study of the psychological underpinnings of reactions to events or situations perceived as unjust. People can become outraged by what they perceive as injustice, and sometimes this stimulates action. We know little about the other passengers and many other facts in this case. My scripts interpolate (linearly) these files in both time and 3D space. I was thinking whether it is worth of applying bi-cubic interpolation. Probably in next life. It seems you just need to simply pick the 3 files from the dataset I shared above. I doubt negotiations were ongoing between anyone on the aircraft and KL. It seems likely that negotiators on the ground in KL would not come up for air. Once the plane was lost they had no leverage, and would have go underground. BTW, martyr is not limited to religious persecution. You can be a martyr for a cause. It is a much more generic term. I am not sure we can so easily dismiss Shah’ s political leanings. He was very active in the PKR, as was his GF. Where did you see @Amsterdam? Thanks for the interesting story on the Air New Zealand flight. I had missed that one the first time. However, I very much doubt that a crew member could open the the door in a couple of minutes, by going into the EE bay. I think that might be pure conjecture on the part of the Press. I am ready to be corrected on this, but I thought you need a special tool to open the EE bay hatch, and you need to know exactly which breaker to pull (if that’s possible) and you could be putting the aircraft in serious danger if you start pulling breakers, without expert knowledge. Just my opinion. Arguments between flight crew are not as rare as we would like to believe. Mere human beings, after all, and all that. I read about an incident involving a FlyBe flight from the UK to Spain, in 2011. An argument erupted between the Captain and FO when the Captain refused to fly round some threateningly dark clouds (the flight already running 20 minutes late) to avoid turbulence. On the return flight, the FO spent the whole time reading a newspaper! @Ge Rijn 🙂 Well spotted.I meant @Nederland, not @Amsterdam. Sloppy on my part. @DennisW, I stand corrected . Indeed, martyr is not limited to religious persecution. In my post above I tried to state same under similar lines! Yes, reading the story it seems unlikely the co-pilot went into the EE-bay (no special tool needed though) and unlocked the door there. The explanation given by the captain he was in the middle of some flight-actions (with probably no need for the co-pilot to be there at that time due to the tensions) seems to be more likely and after that the captain probably unlocked the door himself. Only the investigation-report can give the details what realy happened. Not another press-article without any official reference. He claims that employees in government service, including at MAS, may face summary dismissal if they are found to be associated with the opposition. (min. 3:30) Not sure if this is exaggerated, he only mentions one case, and political leanings towards the opposition seem to be fairly common amongst Malaysia’s middle class. Well that sure is a fabrication. Anyone can cook up a fake Facebook page. Yes naturally Zaharie, an upper middle class and nice looking malay man chose to seek solace in the company of a plain, ordinary woman with three children, one with cerebral palsy, rather than any one of the attractive flight attendants without said baggage. Just a bit too ridiculous a bit of spin doctoring. She became emotionally needy, he withdrew. it is not so complicated a scenario and not enough to drive a person into the Indian Ocean. Anwar Ibrahim is not in prison the 18 year on and off court case is not about criminal charges it is about discrediting him, distracting him but it really does not matter because there is one ruling Malay party. The Malaysian Chinese and Malaysian Indian population had much more to protest about the system than Zaharie who was a member of the ruling Malay class. The Malaysian middle class would like a democratic process rather than a fake democratic process but talk over long buffet dinners. They are living a comfortable life and it all becomes conversation rather than political extremism. I am always impressed by the 69 yr old Anwar Ibrahim’s calm in the face of such long standing (18 yr) trumped up charges, the top guy not stirring hostility. Further to your comments I understand from previous postings some time ago Captain Zaharie was a relief Captain for MH370 with reasonably short notice (weeks). This doesn’t rule out pilot suicide of course. Also I read somewhere recently that Zaharie’s wife said the sign off at IGARI was not her husband’s voice. I probably should find the reference. She may well be right but there is a clear conflict of interest here. I think you are on the money with the comments about the corrupt 1MBD Strategic Development Company. Prior to 8th March 2014 US$681 turned up in Prime Minister Najib Razak’s bank account. Its stated purpose was political campaign funding but for some reason the bulk of the funds have been returned to Saudi Arabia (reason?). The big question of course is if all of these facts and 9M-MRO are on the same page. Meanwhile we have a barnacle covered flaperon in the hands of the French as part of a criminal investigation and an adjacent, quite large section, of the jet’s outboard flap with essentially no barnacles being analysed by the ATSB. And the MG showing almost no interest. All very strange.